Mix the first 3 ingredients together in a small saucepan and bring to a boil. Remove from heat and stir in the vanilla & cinnamon. Pour over oats and stir until coated thoroughly. Spread oats in a 9 x 13" pan. Bake at 375F. Put the pan back in the oven then turn it off. Leave it overnight and then have some on your yogurt the next morning. Mmmmmm, delicious! I had never made granola before and this was not only super simple but it was also frugal, healthy, and most importantly, very tasty. *UPDATE* Since I have been making this for years now, I have tweaked it to our tastes. Sometimes I use coconut oil and sometimes I use vegetable oil; it's good either way. When I say it will be a bit sticky, I mean A LOT sticky. When you take it out of the oven the next day, it will be hard. I try to break it up in the pan a little bit. I put parchment paper in the bottom of my metal pan because the stuff will stick like crazy or spray the heck out of my glass pan before I put the granola in it. The method is still the same and I make this constantly because my peeps really like it. My recipe was featured on Pin It Tuesday! This is part of Miz Helen's Full Plate Thursday & Works for Me. Brunch is universally lovely isn't it? 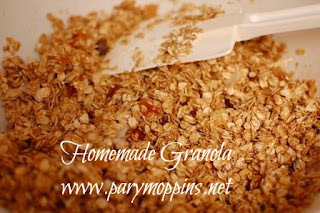 Nothing is like homemade granola... yum! I have just started making my own granola (it tastes better and is so much cheaper than shop bought) - I love the idea of using honey in the mix, so will definitely have to try your recipe. Pinning - via Pin it Tuesday. You're right! It is much cheaper to make your own and this way, you know exactly what's in it as well. Thanks for stopping by! You are featured in this weeks Pin It Pinterest Link up! I just love a granola like this to sprinkle on my yogurt that I have every morning, it looks awesome! Thank you very much for sharing with Full Plate Thursday and have a great week! We like this with yogurt too! :) Thanks for stopping by!